Fr. Tony was born and bred in Southampton - and was educated within the city boundaries before embarking on further education in the armed forces leading to economics and business studies to university level. Fr. Tony's church studies began, as most youngsters, in Sunday school, his being the Bitterne Park Congregational School, for which he proudly carries his presentation pocket Testament each Sunday presented to him on his promotion to the intermediate dept many years ago. From then he joined St James Church at West End and through choirboy level became an altar server under the Rev'd Ivor Machin. They used to have regular teachings in basic theological studies which he remembers to this day. The church at this time was "high" C of E - true anglican, and he felt his Christian education was a tremendous boost to his teenage years. He was there for almost 3 years and then the family moved to Hythe on the edge of the New Forest . Fr. Tony then joined the local church - St. John the Baptist, under Rev'd Molyneaux - and quickly became an altar server under him. This particular church was low C of E and he suddenly became aware of the vast levels of service. He joined the army when he was 21 - did his basis training with R.E.M.E. and was posted to the 7th Armoured Brigade in Germany where he was with the 5th Royal Tank Regiment until 1964 - known as the "Desert Rats". Since his demob he has worked locally both within transport companies and for himself - which he still does to the present day. Fr. Tony says: ‘My faith basically kept pace with me - but not too much to the fore - that is until I met up again with Fr Terry'. Fr Terry rekindled his interest in the church and after a few weeks of consideration he realised that he was missing a lot from his life'. Fr. Tony then agreed to come along to St Francis and have a look and to meet the then Fr Martyn, and the rest is history, so to speak. Fr. Tony now feels that St. Francis is part of his extended family, and he is now proud to serve alongside Bp. Martyn and help in any way that he can. Fr. Tony has been studying under the tutelage of Bp. Martyn and will continue with his formation which will include practical sessions during weekend Clergy Training and retreats. Fr. Tony was Ordained to the Sacred Priesthood on Sunday 11th April 2010 at St. Francis, Southampton, by Bishop Martyn. Fr. 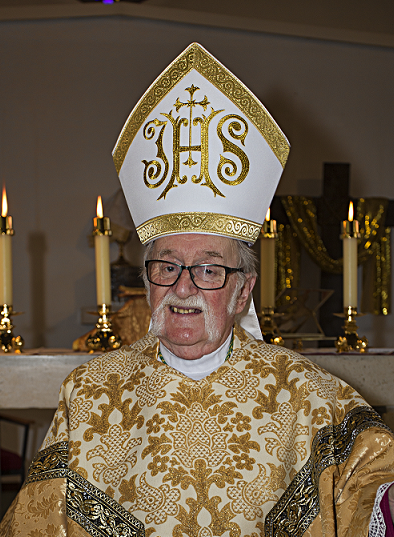 Tony was Instituted as Parish Priest of St. Francis of Assisi, Southampton on Sunday 31st October 2010 whilst on retreat at Nympsfield, and Inducted the following Sunday at Southampton. Fr. Tony was made a Canon on Sunday 8th May 2011 whilst on Retreat at Nympsfield. During retreat on Sunday 1st May 2016 at Nympsfield, Fr Tony was consecrated Auxiliary Bishop of Clausentum.